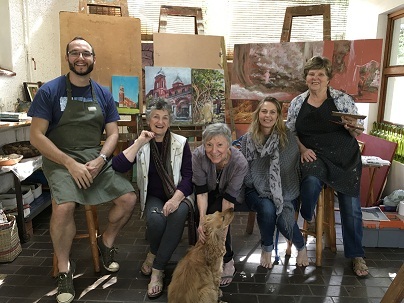 A group of Durban artists will hold an exhibition at Mariannhill from November 5 to 12 to celebrate the extraordinary impact an obscure Catholic order of monks made in KwaZulu-Natal more than 135 years ago. It all began in 1879 when the Cistercian Order of the Strict Observance, otherwise known as the Trappists, decided to send a pioneering group of 31 monks under the leadership of Father Franz Pfanner to establish a religious colony in southern Africa. After one failed attempt in the Eastern Cape, the Trappists bought a farm near Pinetown in 1880. Two years later, under the direction of their architect, Brother Nivard Streicher, they had constructed a towering red-brick monastery in the neo-gothic style that Father Pfanner named Mariannhill, after the Virgin Mary. In an amazing burst of energy, the Trappists then added another 22 mission stations – all within a day’s ride of each other – between 1882 and 1900. Controversy, however, courted every early move that Father Pfanner made. In order to respond to the wishes of local chiefs who wanted the missionaries to “teach the book” to their people, he had to disobey the contemplative order’s strict rules of silence and also ignore its prohibition on teaching. He also went against a ruling that the order was to have no contact with women, introducing a group of them as teachers at Mariannhill. Eventually they would become the Sisters of the Precious Blood. When the general council of the order discovered the nature of the missionary activities being undertaken in Natal, they removed Father Pfanner from office and effectively exiled him to one of the outstations – Emmaus – where he spent the last 15 years of his life before he died in 1909. By then, however, his life’s work had been vindicated as the Trappists, having been expelled from their order, now became a new entity, the Missionary Congregation of Mariannhill, whose priests are still active today. The religious politics is a fascinating sideshow for the group, but not central to their interest in Mariannhill and its outstations, which are still used today although some of them are in a state of disrepair. It transpired that the painting was a detail of a mission church at Reichenau, near Underberg, described by local architect Robert Brusse as Brother Nivard’s masterpiece. Peter then provided her with some literature about the Trappists and Maggie was hooked. Maggie noted that in recent years the group had enjoyed regular excursions to outstations such as Centocow, Lourdes and Emmaus, and been inspired in different ways by what they had experienced. Members of the group have also visited the archives at Mariannhill and based their artworks on the architectural drawings of Brother Nivard as well as a series of fascinating early photographs taken of the priests working with the community. It’s a little known fact that Mariannhill was visited by Mahatma Gandhi and Mark Twain, with one of the monastery’s famous students being Steve Biko. Maggie recalled some of the group’s excursions to various outstations with a smile. “They’re really out of the way and sometimes we got beautifully lost in the lovely rolling hills.” One excursion concerned an attempt to find one such mission station at Otting. A remarkable coincidence also served to cement the links between the group and their Trappist enterprise. One of the new members, Nomsa Ngidi, had changed her focus from painting landscapes to portraits. One day, Maggie visited the Mariannhill archive and saw a photograph of a man who looked a lot like someone Nomsa had painted. It turned out that the man, who was one of the first three black ministers to be ordained in Rome, was her great uncle. The exhibition, which will include photographs, paintings and multi-media artworks, will open at the St Anne’s Hall at Mariannhill at 11h30 on November 5.